...without needing the keyboard and mouse. You're probably familiar with the idea of using a TV as a display for your computer or laptop. It's great having a bigger screen but using a keyboard and mouse isn't always convenient or comfortable. Half the time you're either hunched over the keyboard or searching for a flat surface. With Keysticks, you control your computer with a gamepad or joystick instead. The software turns the signals from your controller into mouse movements, clicks and key presses for you. It can do more advanced things too, like opening your media player or switching between windows. 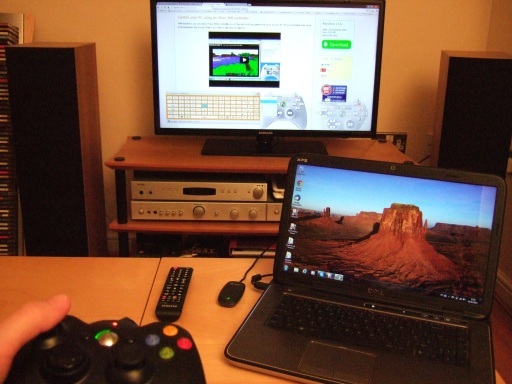 You use the normal Windows Control Panel options to choose whether to make the TV the main display, to duplicate the desktop on both screens, or to extend the desktop across both screens. You can use a wireless or wired Xbox 360 controller. It's ideal if you have a wireless controller because then you can put your laptop wherever you want and just look at the TV. But wired controllers are fine too because they usually have a really long cable. You don't need a Smart TV to use the internet on your TV. Connect your laptop instead. With Keysticks, you can use a gamepad to browse to your favourite programmes on catch-up TV sites like BBC iPlayer. You can also do other things like control DVDs and music playing on your laptop, browse your photos on your TV, and play PC games. It's up to you. Keysticks comes with ready-made controls for general Windows use and for controlling your media player. It has features that are specially designed to help with using your TV as a display. You can view the controls on-screen and there are zoom, style, colour, and transparency options to suit your preferred TV viewing distance. When you need to type text (e.g. to enter a search term), you can pop up the virtual keyboard window which has word prediction to save you entering every word in full.